A competent Collections Specialist will contact clients and collect outstanding payments. 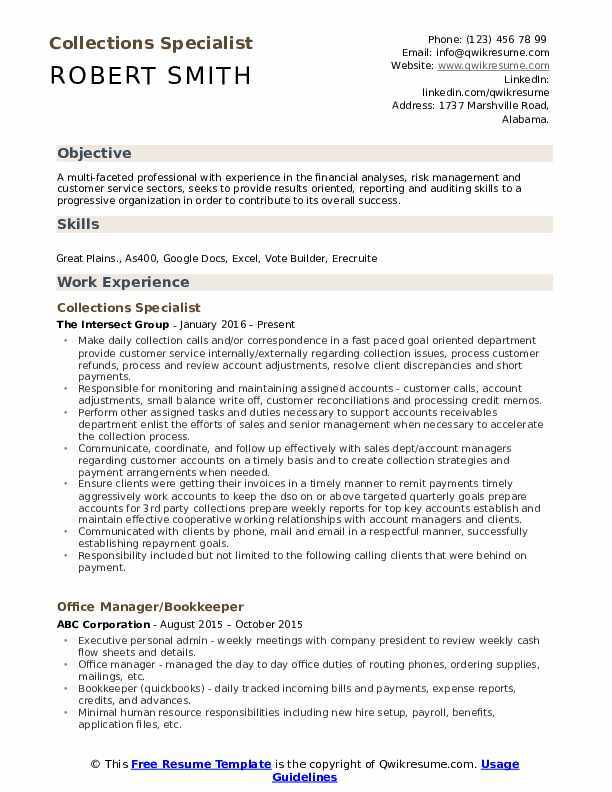 The major job tasks listed on the Collections Specialist Resume include the following – monitoring accounts to identify outstanding debts, investigating the credit history of every debtor, finding and contacting clients to detect overdue payments, taking actions to collect debts on-time, processing payments and refunds, resolving billing and customer credit issues, updating account status records, reporting on collection activities and accounts receivable status. 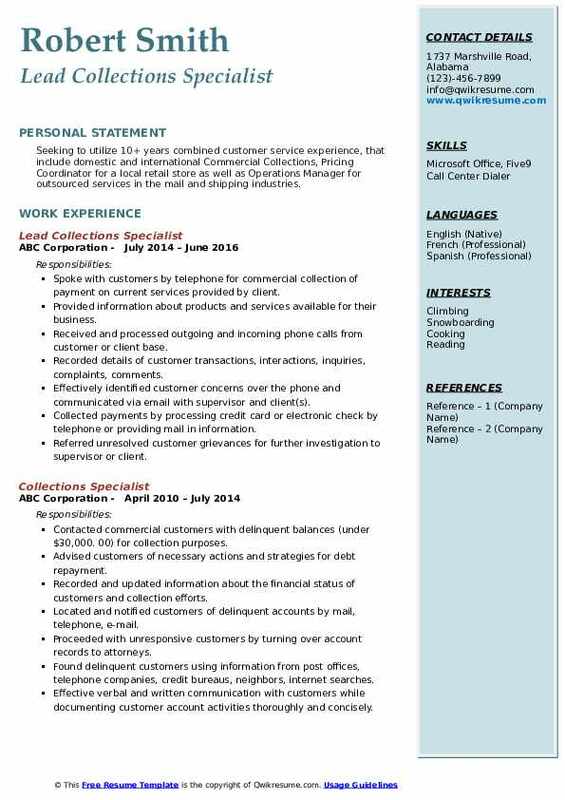 To compete in this field, candidates applying for this role should denote these skills – proven work experience, knowledge of billing procedures and collection techniques, familiarity with FDCPA; working knowledge of MS Office and databases, and excellent negotiation skills. Possessing QuickBooks knowledge will be advantageous. A high school diploma or an Associate’s degree in any field is commonly seen in most of the successful resumes. 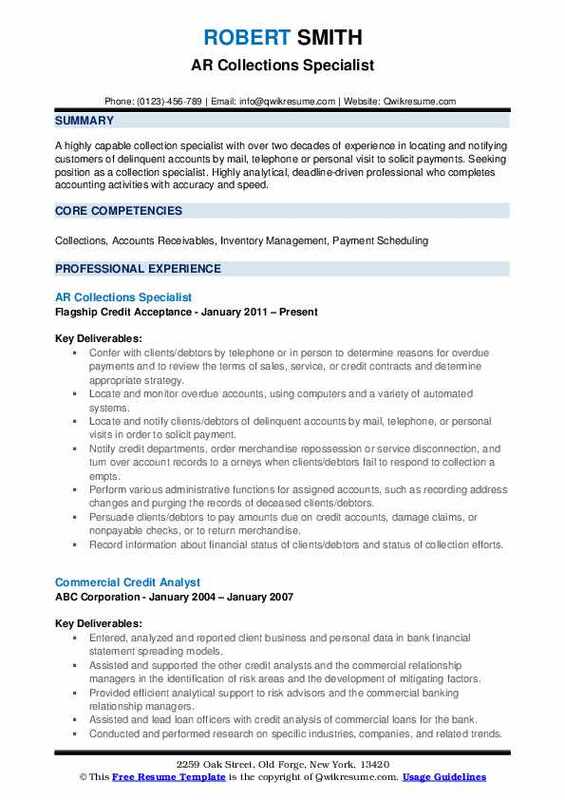 Headline : Motivated, personable, and dynamic business professional with nearly twenty years of experience in various accounting processes (A/P, A/R, Collection). A strong administrator-well organized, decisive, energetic, with a talent for quickly mastering technology. Diplomatic and tactful with professionals at all levels. Thrive in deadline-driven environments. Excellent team-building skills. Identified delinquent accounts, took appropriate action, and recorded pertinent notes in system. Communicated with sales team and customers regarding account status, orders, and payments, builds customer relationships. Analyzed credit service bureau data as needed and recommended changes required to credit limit or collection actions. Identified high risk /delinquent accounts and initiated collection action. Action included but was not limited to placing orders on hold and contacting customer for payment via email, fax, and/or phone. 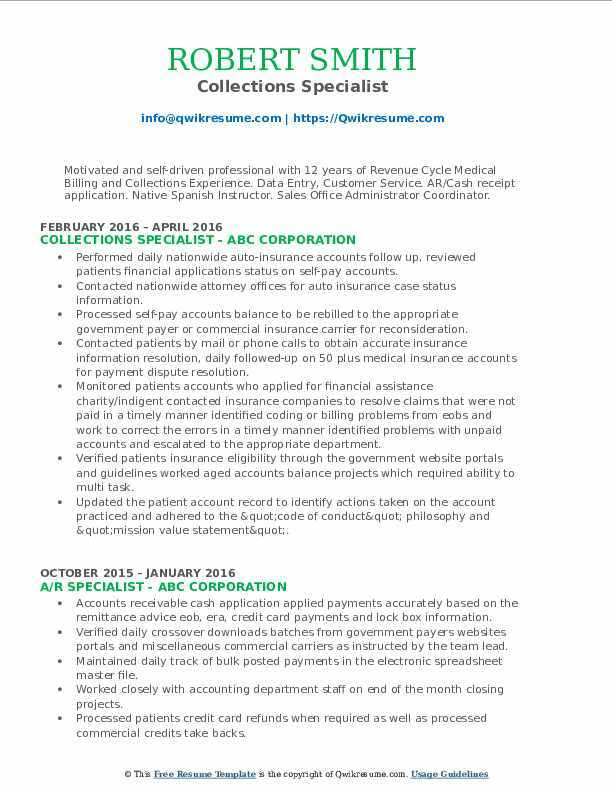 Documented customer contact and collection action taken in accounts receivable system and physical file as needed. Made recommendations on accounts receivable reserve for accounts within assigned portfolio. Provided input when placing accounts with a collection agency or a third party attorney. Notified sales department of delinquent accounts and any actions being taken. Developed customer relationships and understood how the customer fits into company strategy. Summary : A highly capable collection specialist with over two decades of experience in locating and notifying customers of delinquent accounts by mail, telephone or personal visit to solicit payments. 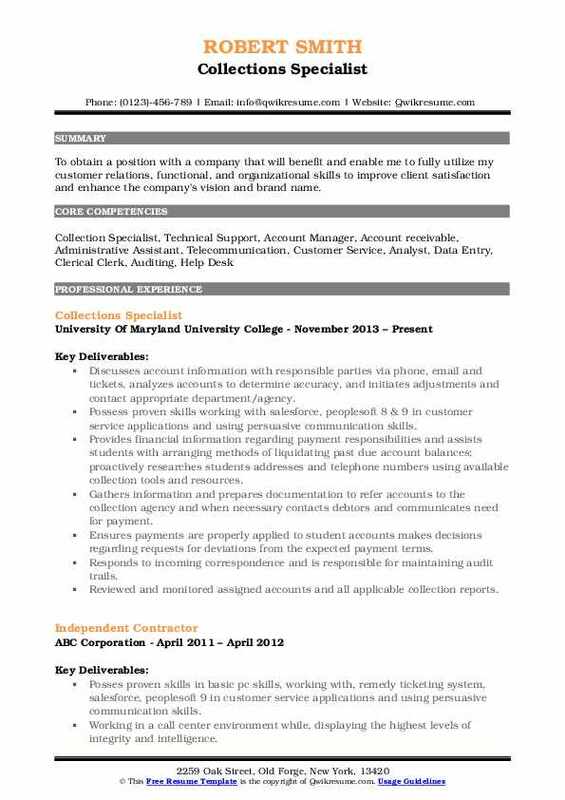 Seeking position as a collection specialist. Highly analytical, deadline-driven professional who completes accounting activities with accuracy and speed. Confer with clients/debtors by telephone or in person to determine reasons for overdue payments and to review the terms of sales, service, or credit contracts and determine appropriate strategy. Locate and notify clients/debtors of delinquent accounts by mail, telephone, or personal visits in order to solicit payment. Notify credit departments, order merchandise repossession or service disconnection, and turn over account records to a orneys when clients/debtors fail to respond to collection a empts. Perform various administrative functions for assigned accounts, such as recording address changes and purging the records of deceased clients/debtors. Persuade clients/debtors to pay amounts due on credit accounts, damage claims, or nonpayable checks, or to return merchandise. Record information about financial status of clients/debtors and status of collection efforts. Trace delinquent clients/debtors to new addresses by inquiring at post offices, telephone companies, credit bureaus, or through the questioning of neighbors. Advise clients/debtors of necessary actions and strategies for debt repayment. 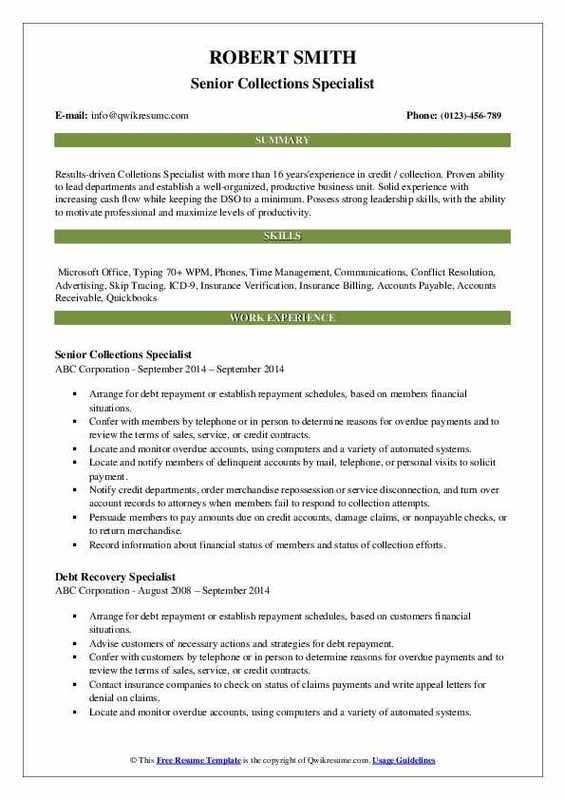 Headline : Results-driven Colletions Specialist with more than 16 years'experience in credit / collection. Proven ability to lead departments and establish a well-organized, productive business unit. Solid experience with increasing cash flow while keeping the DSO to a minimum. Possess strong leadership skills, with the ability to motivate professional and maximize levels of productivity. Arrange for debt repayment or establish repayment schedules, based on members' financial situations. Confer with members by telephone or in person to determine reasons for overdue payments and to review the terms of sales, service, or credit contracts. Locate and notify members of delinquent accounts by mail, telephone, or personal visits to solicit payment. Notify credit departments, order merchandise repossession or service disconnection, and turn over account records to attorneys when members fail to respond to collection attempts. Persuade members to pay amounts due on credit accounts, damage claims, or nonpayable checks, or to return merchandise. Record information about financial status of members and status of collection efforts. 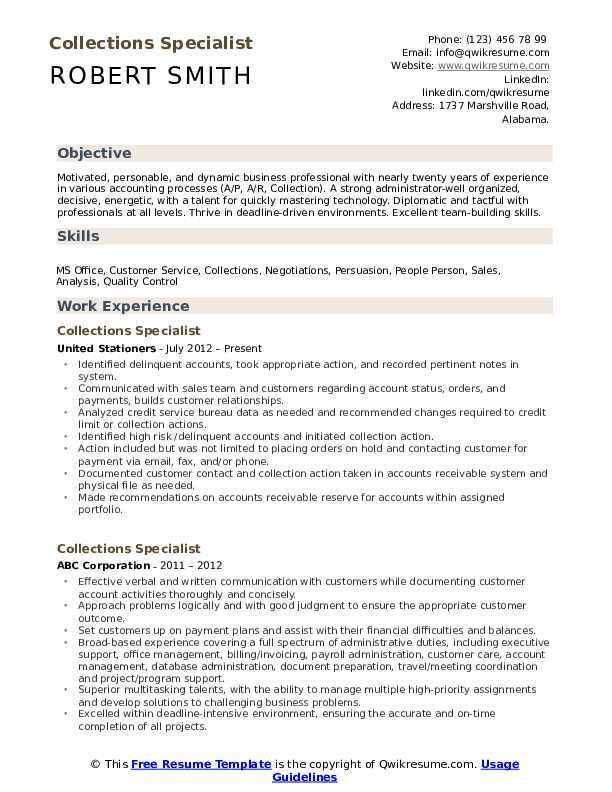 Headline : As a qualified Collections Customer Service Representative, offering a record of a successful job performance, including problem solving ability and experience developing and implementing innovative solutions I am committed to addressing customer concerns with speed, accuracy and professionalism. It's my goal to minimize any customer dissatisfaction and increase customer loyalty. Responsibilities responsible for arranging for debt repayment or establishing repayment schedules obtaining updated demographic information and maintaining concise notes on each call. 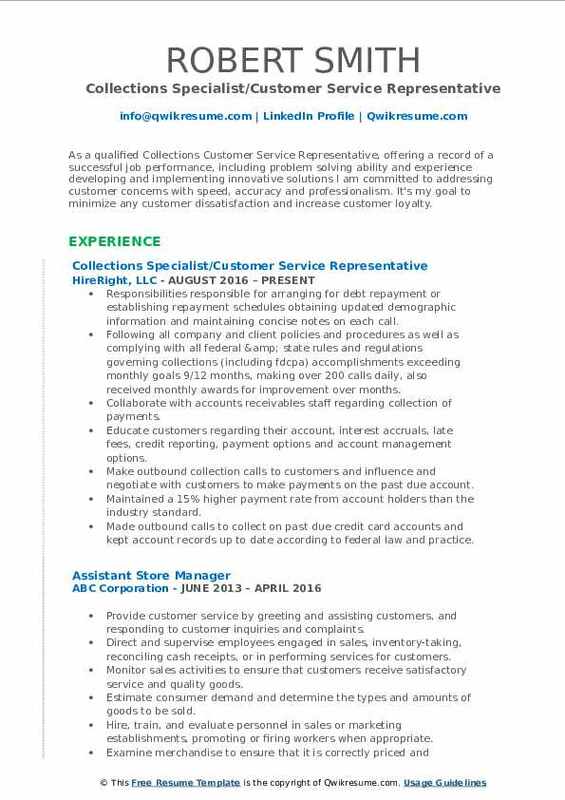 Following all company and client policies and procedures as well as complying with all federal & state rules and regulations governing collections (including fdcpa) accomplishments exceeding monthly goals 9/12 months, making over 200 calls daily, also received monthly awards for improvement over months. Collaborate with accounts receivables staff regarding collection of payments. Educate customers regarding their account, interest accruals, late fees, credit reporting, payment options and account management options. Make outbound collection calls to customers and influence and negotiate with customers to make payments on the past due account. Maintained a 15% higher payment rate from account holders than the industry standard. Made outbound calls to collect on past due credit card accounts and kept account records up to date according to federal law and practice. 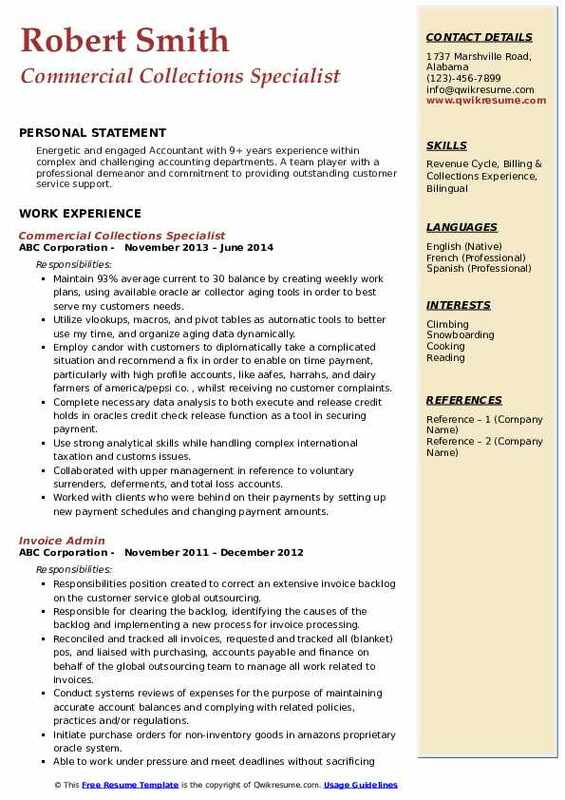 Headline : Seeking to utilize 10+ years combined customer service experience, that include domestic and international Commercial Collections, Pricing Coordinator for a local retail store as well as Operations Manager for outsourced services in the mail and shipping industries. Spoke with customers by telephone for commercial collection of payment on current services provided by client. Provided information about products and services available for their business. Received and processed outgoing and incoming phone calls from customer or client base. Recorded details of customer transactions, interactions, inquiries, complaints, comments. Effectively identified customer concerns over the phone and communicated via email with supervisor and client(s). Collected payments by processing credit card or electronic check by telephone or providing mail in information. Referred unresolved customer grievances for further investigation to supervisor or client. Maintained effective working relationships with customers, sales personnel, and internal departments. 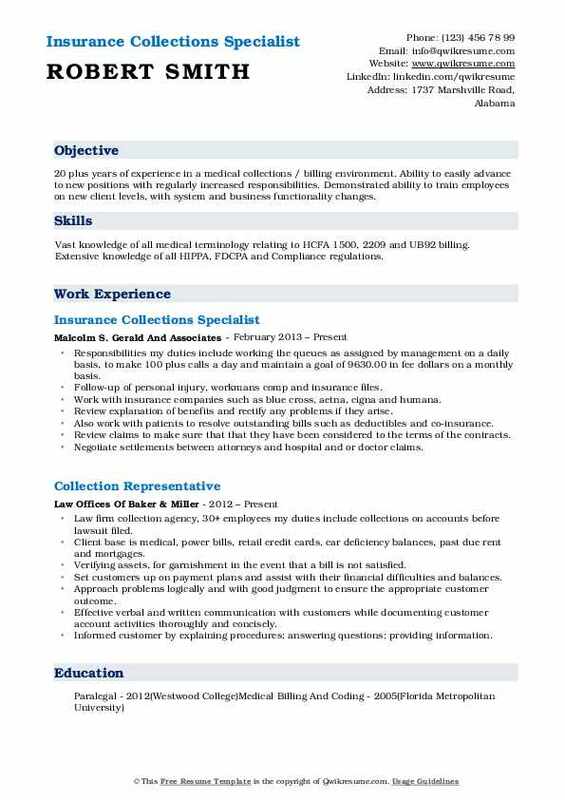 Objective : 20 plus years of experience in a medical collections / billing environment. Ability to easily advance to new positions with regularly increased responsibilities. Demonstrated ability to train employees on new client levels, with system and business functionality changes. Skills : Vast knowledge of all medical terminology relating to HCFA 1500, 2209 and UB92 billing. Extensive knowledge of all HIPPA, FDCPA and Compliance regulations. Responsibilities my duties include working the queues as assigned by management on a daily basis, to make 100 plus calls a day and maintain a goal of 9630.00 in fee dollars on a monthly basis. Follow-up of personal injury, workman's comp and insurance files. Work with insurance companies such as blue cross, aetna, cigna and humana. Review explanation of benefits and rectify any problems if they arise. Also work with patients to resolve outstanding bills such as deductibles and co-insurance. Review claims to make sure that that they have been considered to the terms of the contracts. Negotiate settlements between attorneys and hospital and or doctor claims. Accomplishments have made my monthly goal by either exceeding it or making 90%. Objective : Motivated and self-driven professional with 12 years of Revenue Cycle Medical Billing and Collections Experience. Data Entry, Customer Service. AR/Cash receipt application. Native Spanish Instructor. Sales Office Administrator Coordinator. Performed daily nationwide auto-insurance accounts follow up, reviewed patient's financial applications status on self-pay accounts. Contacted nationwide attorney offices for auto insurance case status information. Processed self-pay accounts balance to be rebilled to the appropriate government payer or commercial insurance carrier for reconsideration. Contacted patients by mail or phone calls to obtain accurate insurance information resolution, daily followed-up on 50 plus medical insurance accounts for payment dispute resolution. Monitored patient's accounts who applied for financial assistance charity/indigent contacted insurance companies to resolve claims that were not paid in a timely manner identified coding or billing problems from eobs and work to correct the errors in a timely manner identified problems with unpaid accounts and escalated to the appropriate department. Verified patient's insurance eligibility through the government website portals and guidelines worked aged accounts balance projects which required ability to multi task. Updated the patient account record to identify actions taken on the account practiced and adhered to the "code of conduct" philosophy and "mission value statement". Summary : To obtain a position with a company that will benefit and enable me to fully utilize my customer relations, functional, and organizational skills to improve client satisfaction and enhance the company's vision and brand name. Discusses account information with responsible parties via phone, email and tickets, analyzes accounts to determine accuracy, and initiates adjustments and contact appropriate department/agency. Possess proven skills working with salesforce, peoplesoft 8 & 9 in customer service applications and using persuasive communication skills. Provides financial information regarding payment responsibilities and assists students with arranging methods of liquidating past due account balances; proactively researches students' addresses and telephone numbers using available collection tools and resources. Gathers information and prepares documentation to refer accounts to the collection agency and when necessary contacts debtors and communicates need for payment. Ensures payments are properly applied to student accounts makes decisions regarding requests for deviations from the expected payment terms. Responds to incoming correspondence and is responsible for maintaining audit trails. Reviewed and monitored assigned accounts and all applicable collection reports. Resolved client-billing problems and rescued accounts receivable delinquency, applied good customer service in a timely manner. Objective : Energetic and engaged Accountant with 9+ years experience within complex and challenging accounting departments. A team player with a professional demeanor and commitment to providing outstanding customer service support. Maintain 93% average current to 30 balance by creating weekly work plans, using available oracle ar collector aging tools in order to best serve my customer's needs. Utilize vlookups, macros, and pivot tables as automatic tools to better use my time, and organize aging data dynamically. Employ candor with customers to diplomatically take a complicated situation and recommend a fix in order to enable on time payment, particularly with high profile accounts, like aafes, harrah's, and dairy farmers of america/pepsi co. , whilst receiving no customer complaints. Complete necessary data analysis to both execute and release credit holds in oracle's credit check release function as a tool in securing payment. Use strong analytical skills while handling complex international taxation and customs issues. Collaborated with upper management in reference to voluntary surrenders, deferments, and total loss accounts. Worked with clients who were behind on their payments by setting up new payment schedules and changing payment amounts. Objective : A multi-faceted professional with experience in the financial analyses, risk management and customer service sectors, seeks to provide results oriented, reporting and auditing skills to a progressive organization in order to contribute to its overall success. Make daily collection calls and/or correspondence in a fast paced goal oriented department provide customer service internally/externally regarding collection issues, process customer refunds, process and review account adjustments, resolve client discrepancies and short payments. Responsible for monitoring and maintaining assigned accounts - customer calls, account adjustments, small balance write off, customer reconciliations and processing credit memos. Perform other assigned tasks and duties necessary to support accounts receivables department enlist the efforts of sales and senior management when necessary to accelerate the collection process. Communicate, coordinate, and follow up effectively with sales dept/account managers regarding customer accounts on a timely basis and to create collection strategies and payment arrangements when needed. Ensure clients were getting their invoices in a timely manner to remit payments timely aggressively work accounts to keep the dso on or above targeted quarterly goals prepare accounts for 3rd party collections prepare weekly reports for top key accounts establish and maintain effective cooperative working relationships with account managers and clients. Communicated with clients by phone, mail and email in a respectful manner, successfully establishing repayment goals. Responsibility included but not limited to the following: calling clients that were behind on payment.